When the coastal krill Nyctiphanes australis is abundant it often swarms at or near the surface, but for a number of years we have had few sightings of krill surface swarms. 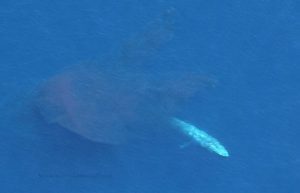 This has been disappointing as abundant surface swarms are not only a sign of a productive upwelling season, but they make it easier for blue whales to find and consume their prey. In turn this makes it easier for us to find and study the whales and their behaviour. The apparent shortage of krill has coincided with a number of ‘lean’ blue whale seasons, during which the whales have been difficult to find in the vicinity of Portland, roughly the geographical centre of their upwelling feeding ground. The 2016-17 season was shaping as yet another lean season, with few sightings of blue whales reported to us, and no evidence of abundant krill. This changed on 28 February 2017 when we flew our first aerial survey of the season, funded by Australian Geographic and the W.V Scott Estate, which covered the continental shelf between Beachport, SA and Port Fairy, VIC. We saw the first blue whale soon after leaving Portland airport, the first of 11 during the survey. While sighting 11 blue whales was rewarding but not exceptional in terms of our surveys, it soon became evident that the real story of the day was the abundance of krill. There were thousands of swarms right across the survey area but most abundant in Discovery Bay to the west of Portland. All the blue whales sighted were close to krill swarms, but only one of them was actually feeding; the others were moving very slowly, most likely well fed and in no hurry to move elsewhere. We have long been trying to understand the dynamics of the upwelling and how it influences krill abundance – the key to understanding blue whales in the Bonney Upwelling. The 2016-17 upwelling season was unexceptional, with only weak upwelling up to the date of our survey. However, the previous (2015-16) upwelling season had been relatively strong and the abundance of krill this year may be a consequence of oceanographic conditions a year ago. Interestingly, two days after our aerial survey the first strong, sustained upwelling event of the season commenced. Only a week before the aerial survey we had been out in our boat in the area where some of the blue whales were sighted, and had seen no sign of krill or whales. Were they somehow responding to environmental signals that heralded the belated onset of upwelling in the region? On 10 March we returned in the boat to the area where seven blue whales were sighted during the aerial survey – and found no krill or whales! If we hadn’t done the aerial survey we could be excused for thinking that it was yet another lean year for blue whales and krill. But we know they are out there and can’t wait to get out there again. The 2016-17 blue whale research season got off to a late start but is now well underway. Our core programs for this season are the Marine Science Youth Mentoring Program, our continuing blue whale photo-identification program, and our aerial survey program. This is the fourth time since 2010 we have conducted the Mentoring Program, which continues to be popular with local high schools. 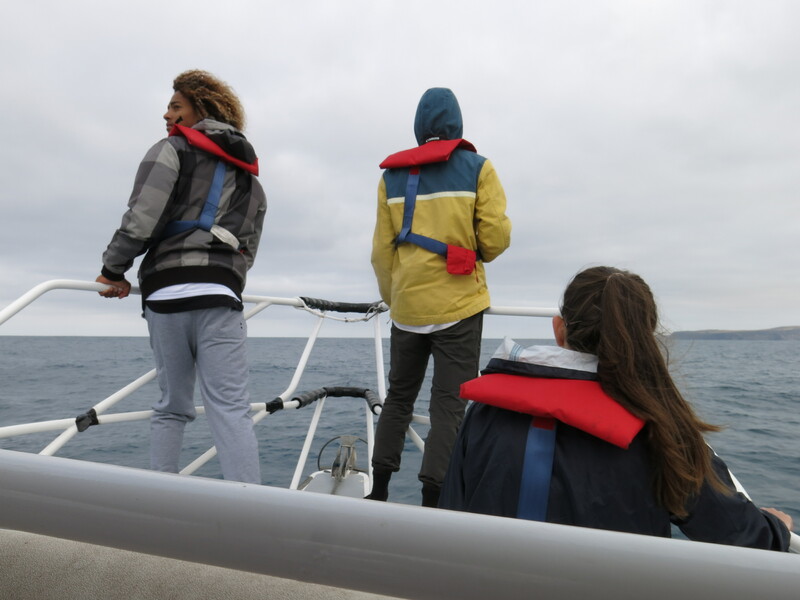 In essence, the schools selected four students who are joining us for four days of boat-based research on the Southern Ocean south of Portland, searching for blue whales as part of our long-term photo-ID work. They learn the basics of seamanship and boat handling, insights into the ecology of blue whales and other fauna of the Bonney Upwelling, and an introduction to marine science methods with a focus on cetacean research. Our aim is to provide a unique opportunity that will encourage local youth to consider a future in marine or environmental science in our region. The program is funded by the Isobel and David Jones Family Foundation of Warrnambool, the W.V. Scott Estate and Australian Geographic Society. Around fifteen youngsters enjoyed a special presentation by Dr. Peter Gill, Blue Whale Stuy’s Senior Research Scientist, at Portland’s Upwelling Festival. Under the shadow of the very large inflatable blue whale the youngsters got to see what krill looks like and touch a large sample of blue whale baleen. “When you show just how big blue whales are and explain they are the largest living creature on earth, bigger than any dinasour, the kids eyes light up and they want to know more and more about them. We are lucky to have the large inflateable blue whale to give some idea of size. This year I used rope to outline just how big a blue whale tongue is” said Dr. Gill. The children also learnt why the blue whales visit the ocean off Portland coastline and what they are doing there. “It is important that local children know about their own environment and in particular the marine environment as it has always been part of our history and prosperity. I hope that I can inspire our young budding marine scientists to take up an interest in the blue whales and our marine envionment” said Dr. Gill. 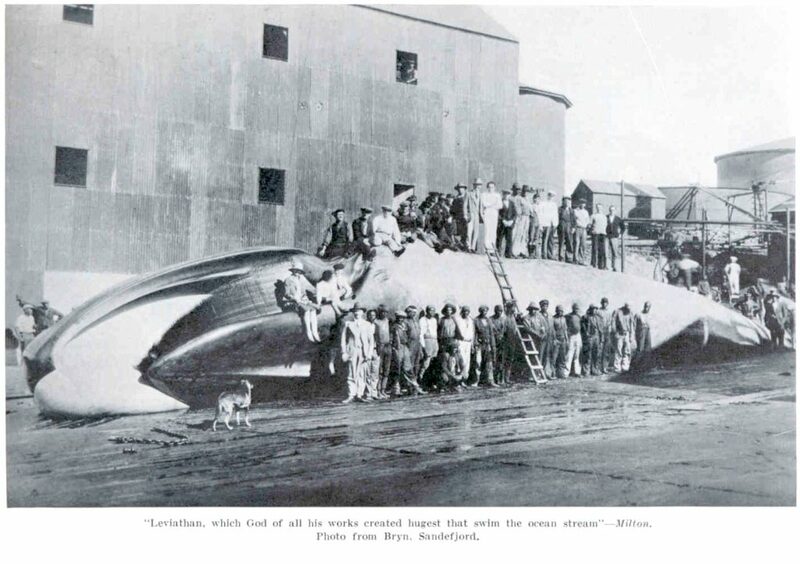 The topic of illegal Soviet whaling impacts on bue whales became a popular topic during the Upwelling Festival. Dr. Peter Gill, Senior Research Scientist from Blue Whale Study, started the day with an early morning ABC radio interivew. Dr. Gill spoke of about the devastating secret whaling program carried out by the Soviet Union between 1947-1972. Using the largest whaling fleets ever assembled, the Soviets combed the oceans of the Southern Hemisphere, slaughtering hundreds of thousands of whales while declaring greatly reduced numbers caught and sometimes just a a handful. 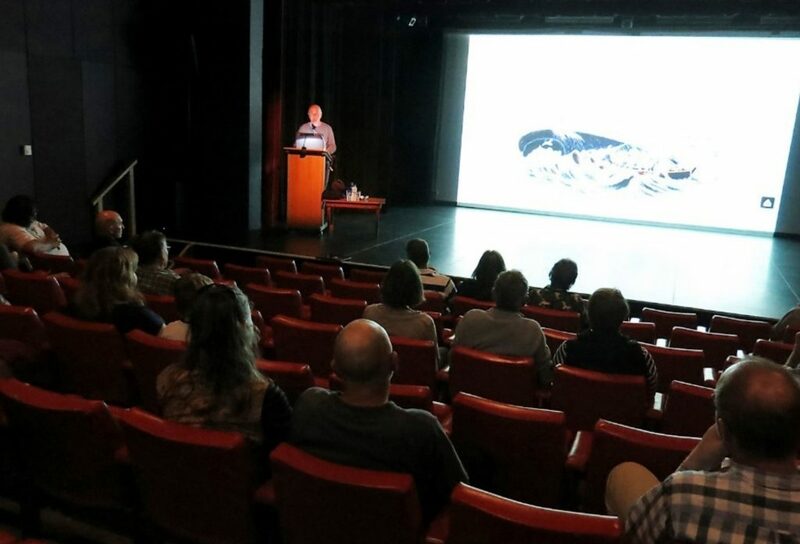 Dr. Gill also gave a presentation at the Portland Arts Centre as part of the Upwelling Festival marine environment talks. The presentation was attended by approximately 50 people who heard of they killed thousands of protected blue whales, some of them not far to the south of Portland, and all but wiped out the humpback whales that migrated up Australia’s east and west coasts. “Humpbacks have now recovered strongly from whaling, but blue whales are still endangered and showing few signs of recovery” said Dr Gill. The presentation also included slides of how the whales where hunted and captured by the whalers. “When you see the photos of what was going on it was quite shocking. We now have such low numbers of blue whales and as a result are listed as Endangered by the Australia Federal Government. It is imperative Blue Whale Study conducts surveys, both aerial and ocean based, to ensure we gather data every Upwelling season. The information we gather builds a picture of their movements and feeding habits in the Bonney Upwelling region just off the coast of Portland”, said Dr. Gill. Bayview College Marine Science students were recently enlightened on the ecology of the blue whale and the Bonney Upwelling phenomenon. 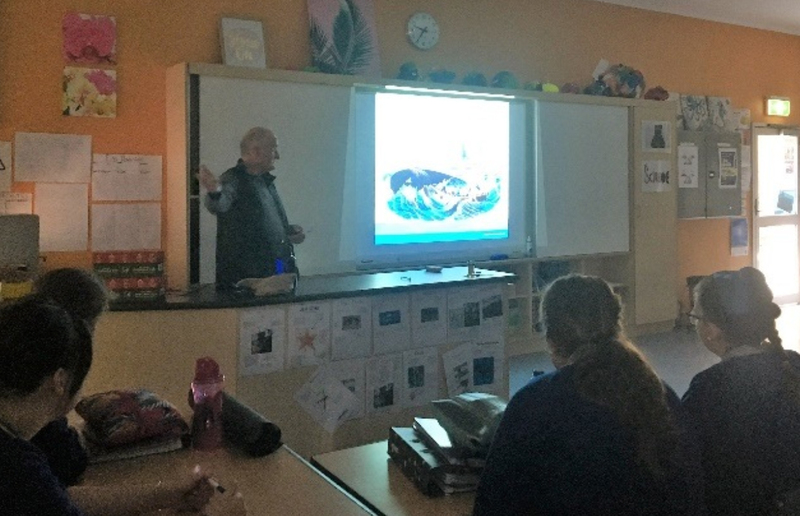 Dr. Peter Gill, Senior Research Scientist with Blue Whale Study presented to thirty Year 11 students who were keen to find out as much as they could about the largest living creature on earth. Stacy Thomas, Science Teacher from Bayview College said “Hearing about blue whales is fascinating and learning about the Upwelling and the plight of the Blue Whale from specialist Dr Gill is the best way to learn as students relate to the content. We are very lucky to have Dr Gill living in our area and benefit from his expertise especially during the week of the Upwelling Festival. Marine Science at Bayview is all about marine science concepts taught in a Portland context”. One lucky student from Bayview College Marine Science class has been given the opportunity to participate in the Blue Whale Study Marine Youth Science Program. “This program is aimed at giving 4 local students an experience of a lifetime. The students go to sea in our research vessel, Bonney Blue, and learn what it is to be safe at sea and how marine science research is conducted and recorded. The program will run for 6 days and commences in February 2017” said Dr. Gill. The Australian Geographic magazine has raised just over $9,000 for Blue Whale Study research. The funds were raised by the Australian Geographic Society via their website and also a gold coin donation at each of the 65 Australian Geographic retail stores around Australia. The funds raised were split between Centre for Whale Research (W.A.) and Blue Whale Study. “To receive this level of support and recognition, at a national level, is outstanding. It just goes to show how precious Blue Whales are to the broader community and how we must never give up our effort to continue our research and secure long term conservation of the species”, said Dr. Peter Gill CEO and Senior Research Scientist of Blue Whale Study. 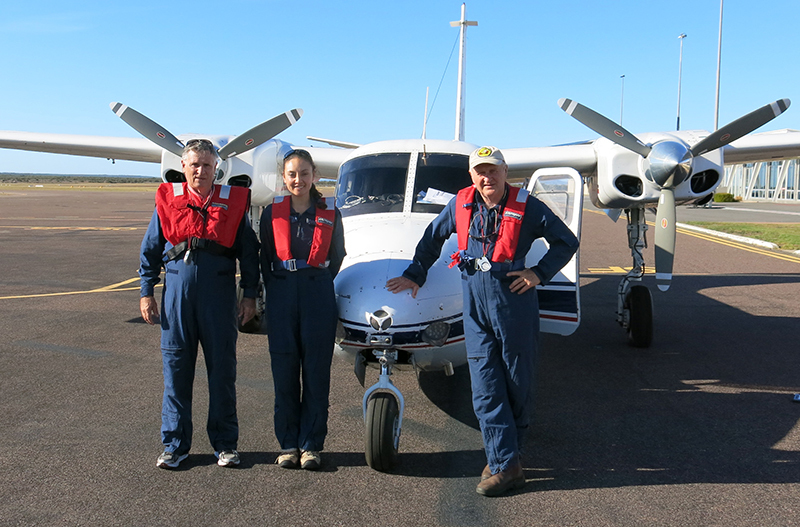 Dr Pete Gill (right) with Andrew Levings and Maria Garcia, about to head off on an aerial survey through the 2015-2106 whale season. Australian Geographic Society works to protect endangered species and the July/August 2016 edition of Australian Geographic magazine provided an in-depth article on blue whales and launched the fundraising campaign under the banner ‘Big Blue Needs You’. In addition the magazine contained a Whale Poster which was drawn by local artist Brett Jarrett. “How often does it happen that the artist and researchers in the same article only live a few miles apart? We are fortunate to have this synergy in our area and thanks to Australian Geographic for bringing us together”, said Dr. Gill. The funds raised shall be allocated to the 2016/17 blue whale season which commences in October/November this year. “We have funding to conduct one aerial survey however ideally we should conduct 2 or 3 each season. With the Australian Geographic Society funds we are now in a position to conduct a second aerial survey which is critical in our efforts to identify individual blue whales and to report on the seasonal variations and monitor blue whale movements in the Bonney Upwelling area”. The Blue Whale Study team are elated that the first Blue Whale Study e-newsletter has finally been launched. “It has taken over 12 months to get to the point where we sent out our first e-newsletter earlier this month” said Dr. Peter Gill, Senior Research Scientist with Blue Whale Study. The e-newsletter is compiled by the team based at Tyrendarra and then sent to graphic artist Nicole Stewart for formatting and editing before being sent out to subscribers via MailChimp. “MailChimp is a platform which is perfect for our small organisation, it provided us with the ability to easily manage subscribers and provide links to the newsletter through other social media outlets” said Dr. Gill. There are to be 4 editions each year based on the seasons. The Winter Blues Newsletter has a dozen short articles with links to the Blue Whale Study website where more information is provided. Updates on field projects, educational activities and news stories are summarised in the newsletter. “Communicating with our supporters is a challenge given the small workforce we have available. The newsletter is a great way to achieve this and as it is a quarterly edition we have the time and capacity to work on articles as they happen and make ready for the next edition”, said Dr. Gill. Tax Time can Help the Largest Living Creature on Earth! Blue Whale Study is dedicated to helping us gain a better understanding of what blue whales do when they visit their SW Victorian feeding grounds in summer. Most people know that the environment is important and would like to do more to ensure it is preserved for future generations. 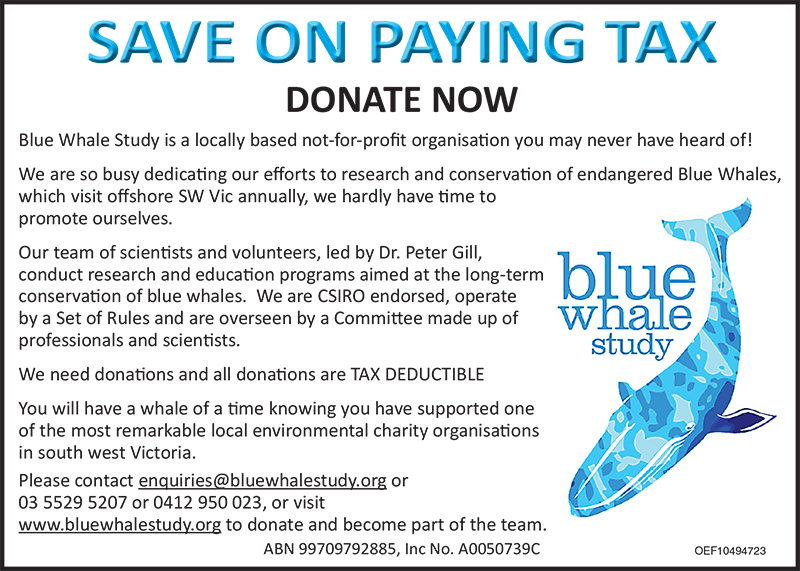 Blue Whale Study is ideally suited to help with this as all donations are tax deductible which provides a win win for donors and the environment. Blue Whale Study is striving to continue vital research on the local Endangered blue whales and their habitat, and also to continue our involvement in numerous community activities which contribute to local knowledge on the significant marine phenomenon, the Bonney Upwelling. “We need to continue our research in the Bonney Upwelling which apart from being globally significant whale habitat, also provides vital resources for the local fishing industry. Also, our Marine Science Youth Mentoring Program is very popular with local schools and we can only run such programs with the help of grants and/or donations from the community’, said Dr. Peter Gill, Senior Research Scientist with Blue Whale Study. ‘The local community benefit greatly in having a program for youth whereby they are exposed to a unique hands on marine science research experience.’. For further enquiries please contact Dr. Gill on (03) 55295207 or Committee member, Ms. Louise Sheba on 0409505686. It was with great excitement the team from Blue Whale Study received news they had been successful in securing funding for the Marine Science Youth Mentoring Program which aims to mentor young science students in marine research. 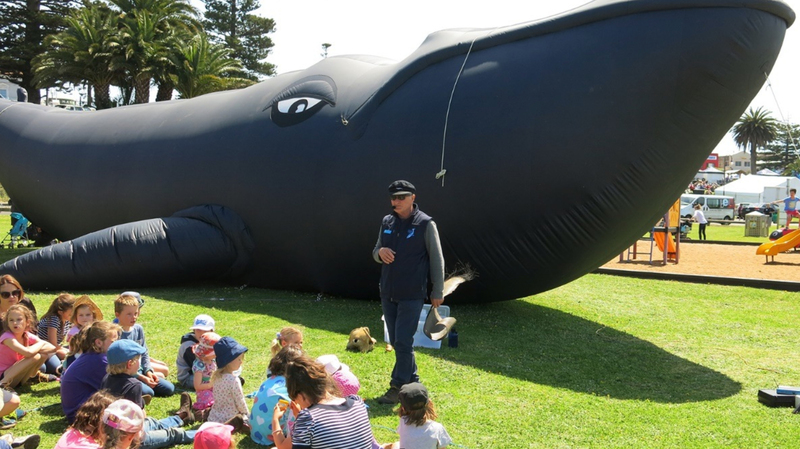 With thanks to funding from the Isobel and David Jones Foundation (facilitated by South West Community Foundation) the program is set to continue for the 2016/17 blue whale season. ‘This is a terrific start to our fundraising for this program. We have been running the program for three years but unfortunately could not run it this year as funding dried up. It is a great boost to have the program up and running again and we shall be making it a priority to secure the remaining funds required to make the program a total success.’ said Dr. Gill. 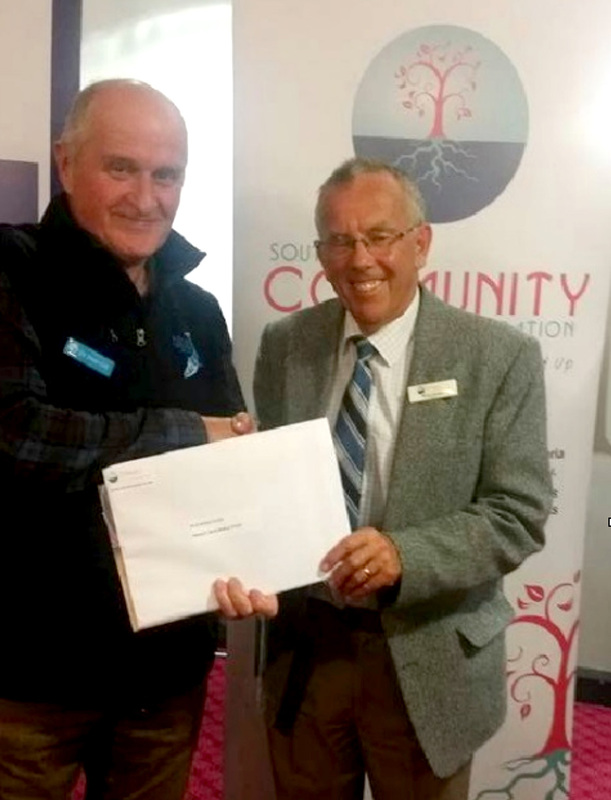 South West Community Foundation Executive Officer, Karen Norris, indicated delight that the Foundation could faciltiate this funding. “The Foundation supported 42 projects in our annual granting round with a great diversity of projects including the Blue Whale Study”. Blue Whales are listed as Endangered and the Blue Whale Study, based in Victoria, is a charitable organisation led by Dr. Peter Gill, dedicated to the research and conservation of these elusive creatures. The mentoring program is a very popular activity for students and involves teachers, students, parents, friends and broader community. ‘This is an important community engagement activity to inform people of the blue whales which visit our region annually’.